Nose: Notes of cocoa, saffron, hazelnut and cigars. It has a noticeable aroma of vanillin. Palate: The initial taste brings exotic fruit, nuts, and menthol. It gives a long peppery finish. 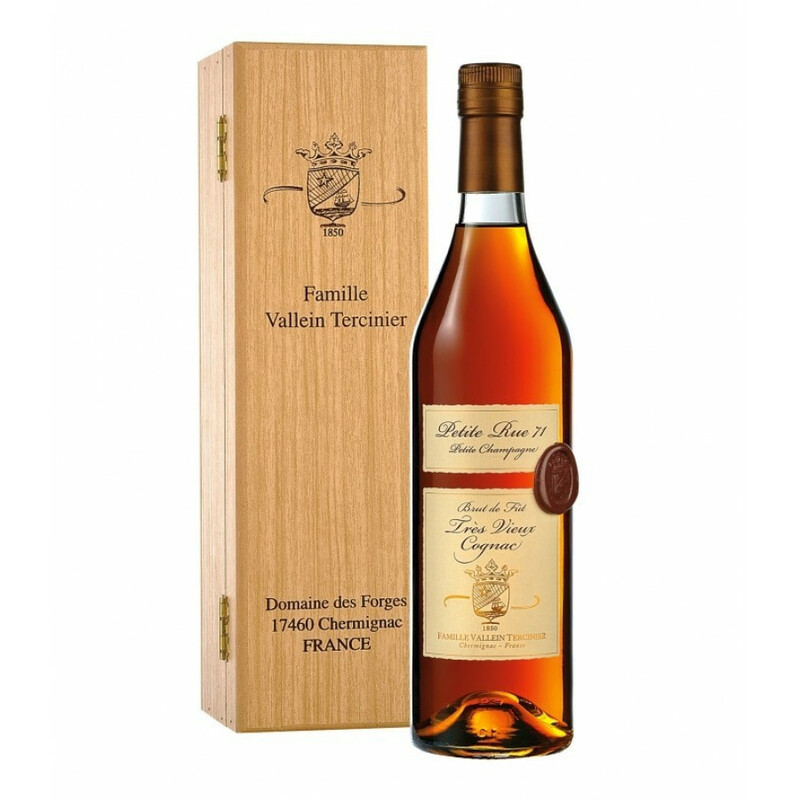 The Vallein Tercinier Rue 71 Cognac is a single cask that is truly daring in character. A single year Vintage dating back to 1971, its combination of sensory elements is sure to instantaneously transport you to the Antilles. Hailing from the prestigious Petite Champagne growth area, it is a lively spirit with an exotic profile of Caribbean fruits. It is simultaneously fresh and sweet, and is a single barrel with plenty of personality. Aged in oak barrels, over time it is reduced, and then a light filtering technique is conducted at room temperature. The beauty of this Cognac is that it is bottled to order. The terroir is compact, with clay and chalk, and this Cognac is a product of the maritime climate that makes the Petite Champagne so elegant and refined. The Vallein Terciner Cognac house is far reaching in history; 500 years in fact, with seeds of knowledge being passed down and planted from father to son, generation to generation. The Domaine des Forges has been the site of much experimentation, allowing them to arrive to the point that they are at today, in which they have created a series of rare blends. They have fully embraced changes in technology, and are an exemplary craft brand. The producers at Vallein Terciner pride themselves on the presentation of their Cognac; as is demonstrated by the Rue 71 Cognac. It arrives in a slim bottle, with the family crest and a wax seal on its side. It is then packaged into a smart wooden box, which is adorned with the family crest. Enjoy it as a digestif, neat, and allow yourself to be taken in by the range of flavors and aromas that it will deliver. It was picked as part of the Sélection in 2015 for the “Cabinet des Curiosités”.